Someone Should Have Counseled Ridley Scott About This Film..
..it was that bad. Really. Every review was spot on and this movie totally deserves the 34% rating it has received on Rotten Tomatoes. Seriously. “The Counselor”, directed by Ridley Scott, stars an amazing cast consisting of Michael Fassbender, as the Counselor, yes that is how he is addressed throughout the film, Javier Bardem, as Reiner a crazy-haired excentric drug dealer, I think, Cameron Diaz, as Malkina, the sensual unpredictable evil counterpart to Reiner, Penelope Cruz, as Laura the counselor’s love interest, and Brad Pitt, as Westray, a smart slick southerner who has no problem pulling up his roots when he fears that his drug deals go south. 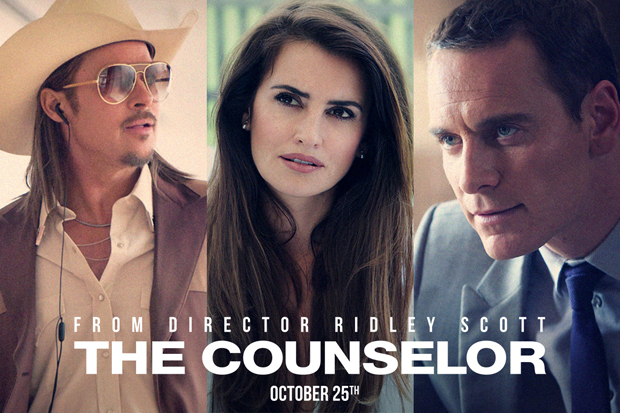 “The Counselor” tells the story of a man who has everything and wants more. The counselor is wealthy but when we encounter him he is about to become even richer by becoming involved in a drug deal and then investing that money into a club, part owned by Reiner. Things begin to go south and this movie just drags it on..and on.. and on. The straw that killed this film is mainly due to the lethargic and obese script written by Cormac McCarthy. Comarc, Cormac, Cormac…I love you man. I love “No Country For Old Men” I also rather enjoyed The Road but damn man, enough is enough. There is only so much philosphy and lengthy speeches explaining this aforementioned philosophy you can have in a film before it becomes dull and confusing. That’s what happened with this film. It became tedious to the point where people left the theater. You heard that correct. People bought 14 dollars tickets and left the theater because this movie was so dry and mired in dialogue. The performances were alright but they were absolutely held back by the lengthy speeches that they had to give. More action, less talking! I have a few more points to make about this film but I fear doing so here will only spoil it for those that really are interested in seeing this mess. For those that have, read on, for those that haven’t, don’t. What was Malkina’s motivation? Greed obviously, but how the hell was she able to target that shipment of drugs. What was her back story? Are we going to have any character development? Who was the counselor making a deal with? It clearly wasn’t the cartel because they went on a killing spree even after they got their shipment back. The major plot point was lot on me. That ending. Ugh. So anti-climatic and yes, Cormac, we know you’re one for the anti-climatic endings, but God, really? She’s dead, everyone’s dead, except for Malkina of course. But I hate her character, so why does she live? I had no attachment to her character and I had very slight attachment to everyone else’s and yet she’s the one that gets away. Awful. That philosophical bartender. You know that one I’m talking about. The Mexican bartender. Sweet. Jesus. Why does every single person have a distinct understanding of life within this film and why did they fee the need to share it? He also spoke impeccable English with a slight accent but was able to have an understandable discourse with the counselor even though he appeared to have very little education. Do extras exist in this film or is everyone given about 87 lines of dialogue. Writing about how bad this movie was makes me even more upset. Don’t go see this, you’ll thank me for it.